The lab where I work has a crank operated stereo microscope stand. It was bought in the 1990s before I started working there. 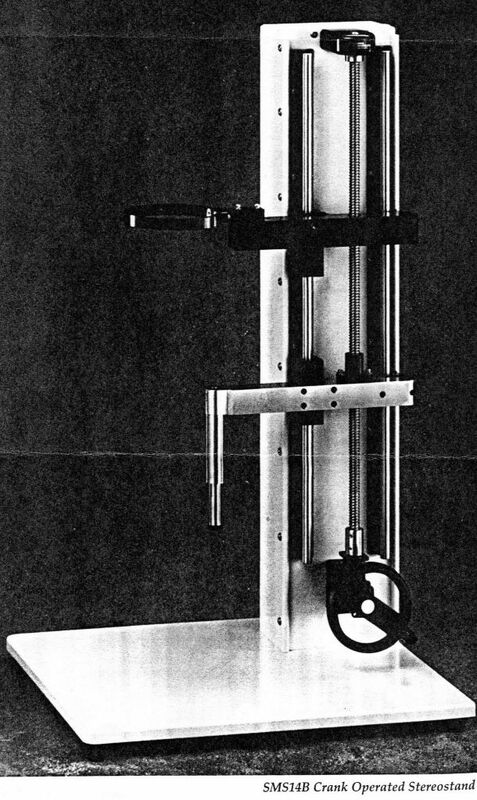 I was able to find some photocopies of the pages of a brochure or catalog of this microscope stand. It's called the SMS14B Crank Operated Stereostand. 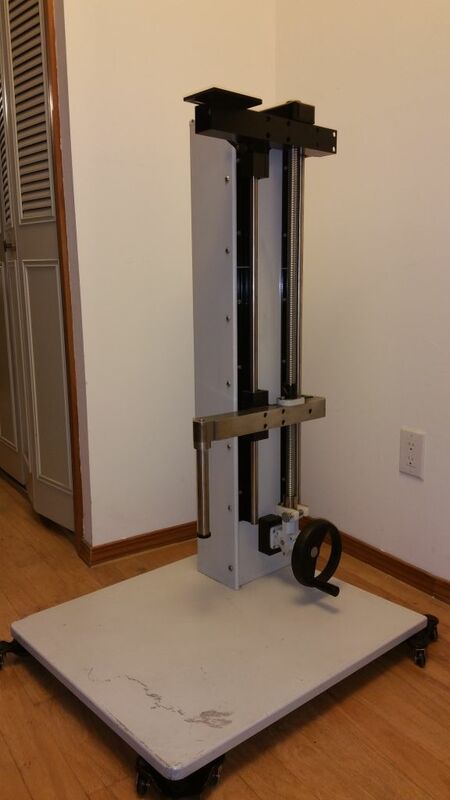 I saw many years ago on EBay that someone was selling this stand with a microscope. Does anyone know more about it or who the manufacter was? Has anyone seen one for sale recently? See the attached images and PDF. I don't know if the item in the lab where you work is related to what I'll show below, though it appears to work in a similar way. But I can say from experience that Velmex, the vendor whose items I'll describe below, makes truly excellent items for photomacrography. I have, use, and recommend quite a few Velmex offerings. 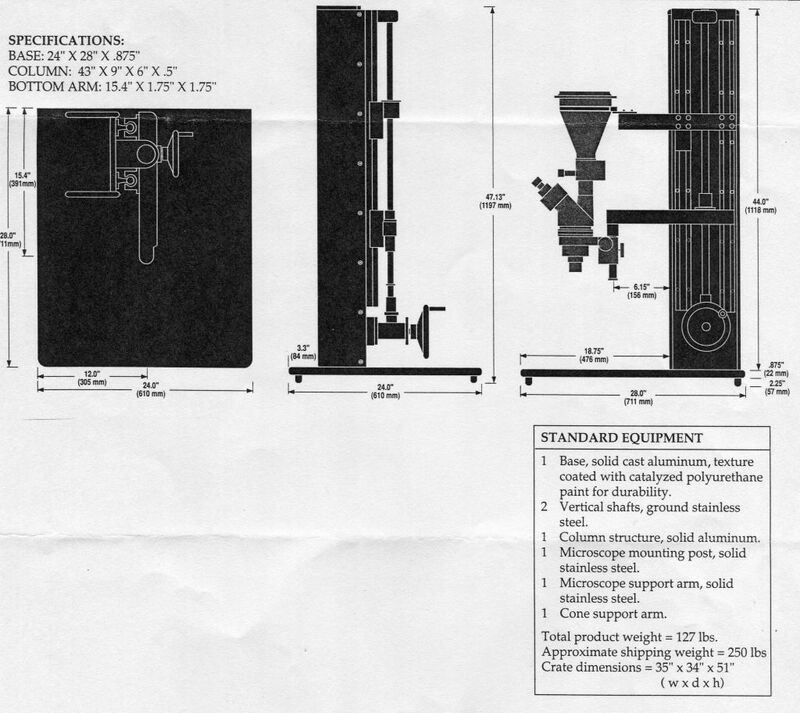 Here is a pdf spec sheet for these Velmex BiSlide assemblies. Please be aware that Velmex BiSlides come up on the second-hand market rather rarely. And when they do, they command high prices. There is a company(Diagnostic Instruments) in Sterling Heights Michigan (suburban Detroit). 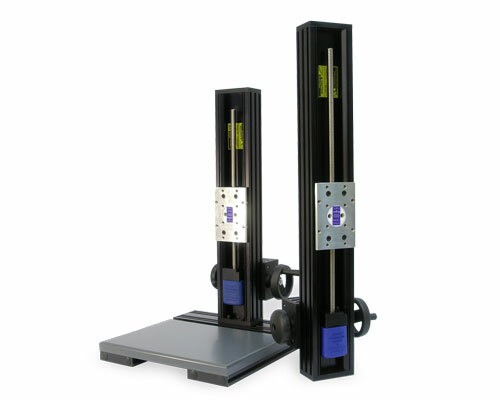 They make boom stands of very high quality and price. There are three reasons why I think this stand was built by Diagnostic Instruments probably in the nineties. 2) The model number sounds like the the model of a monster boom stand I once had from them which was something like SMS 20. That one was a double extention rod ball bushing equipped boomstand that came to me from Zeiss USA and weighed a lot and was packed in a very thick walled wooden crate. 3) The brochure you printed has similar graphics to a piece of DI literature that I have on an ancient transmitted light base which I have my Zeiss stereo on called a CMTB. It looks to have been designed by the same graphics person that did the brochure you attached. It is a virtually positive ID. I can email you a copy of it if you wish. Unfortunately I have contacted DI many many times about discontinued items. They are very nice wonderful people especially in their customer service department. But it has never been possible nor feasible for them to remake stuff they discontinued. When it's gone it's gone. You could try them though. They are easy to find on the web. Call their 800 number and ask for Pat Furgal. Tell her Gene in St. Louis sent you and ask her if they would build you an SMS 14. She will probably tell you she wishes they could and they get requests for it but it can't be done. But maybe they have had enough call for it to do a run, you never know. I love their stuff and lots of it was carried by the major scope companies especially Zeiss. Very good stuff. PS: I have a polaroid copy stand you could mount a stereo on with adjustable spring counter weighting. I know people that have thrown away the 4x5 camera and mounted stereos on them and have a sketch of such a mounting somewhere in my computer. That would be lots cheaper. Thanks for your reply, image, and Velmex link. This is very useful information. That is a very nice stand. Maybe out of my price range but now I have a company name whose products I can research. I'm just researching for possibly setting up my own little microscopy lab. Once again, you provide some very good information. Thank you! I am familiar with Diagnostic Instruments. They do\did make some very high quality microscopy products that are very pricey even used. We have a similar stand at work than the one shown at your link. It is very tall and motorized but wobbly at high magnifications. We prefer using the SMS14B mounted microscope because of its very rock solid stability at high magnifications. Please email the brochure. All the microscope salesman I meet through work tell me the same thing. They all say that stands like that are too expensive to make but people still ask for them. Years ago, when I saw the stand on EBay, the seller would not sell the stand separately from the microscope and photographic accessories. He was selling all of it for about $4k. I'll keep looking. I have seen a number of stands available on fleabay and almost bought various ones. There was a dealer in California called McBain instruments who had a setup to mount heavy scopes on. It had a similar crank or alternatively stepper or servo motors to drive the carriage up and down. I saw several of them on ebay but have stopped watching in the last few years because it is time to reduce the gravitational anomaly centered on my house. Usually sellers wanted pretty good money for the like three to six hundred dollars with no microscope and no baseplate. I am sure McBain charged a similar number only in thousands. Send my your email by PM and I will send you the CMTB pdf. The style is totally identiacal including the tables and drawings in silhouette. It is from the nineties I am told. I JUST missed out on one of these stands on EBay. It was sold with a Leica M420. The seller was offering to sell the stand separately and by the time I was able to login into EBay the whole setup was sold for $2999. If anyone sees this stand anywhere, please let me know. This is the second time I missed out on buying such a stand. I may never see one of these again. They are rare and no one wants to sell theirs. My Leica Wild M10 would be perfect on one of these stands. I was able to buy the stand after all for $800. Someone else just bought the M420 but didn't want the stand. The shipping cost was $225 but I think it was all worth it for this rare stand. 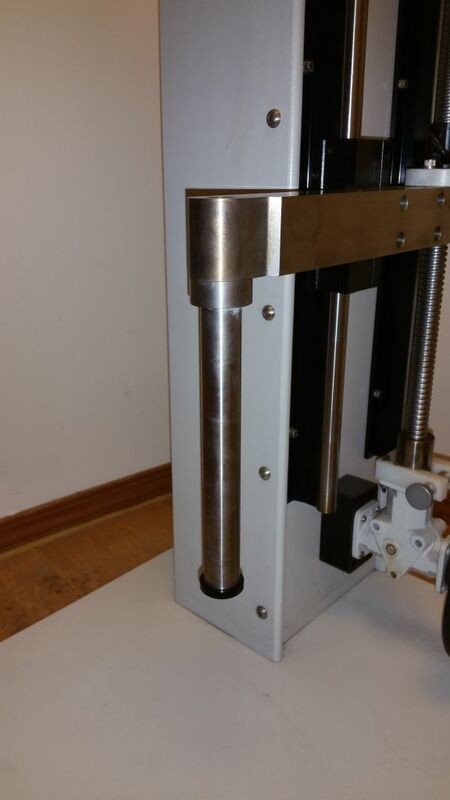 The only problem is that the stand is equipped with a 25 mm diameter shaft mount. I need to have an adapter made to allow me to install my Leica Wild M10 that mounts with a trapezoidal drive column.